Microsoft has unleashed the October 2018 Update on the world, bringing plenty of new features to Windows 10, but perhaps the most exciting one for gamers – at least those who have bought one of Nvidia’s new GeForce RTX graphics cards – is the introduction of support for ray tracing to the OS. Specifically, the big update introduces the first public support for Microsoft DirectX Raytracing (known as DXR for short). This means Windows 10 PCs with the October 2018 Update installed are now capable of supporting real-time ray tracing – as opposed to pre-rendered sequences – providing their GPU also supports this tech. 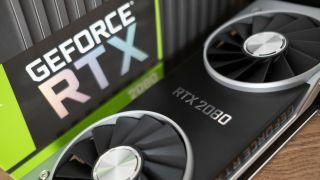 And of course, as we’ve seen with Nvidia’s recently launched Turing graphics cards, these GeForce RTX models are primed to supercharge visuals with an extra dose of realism via ray tracing. DirectX Raytracing will also make it possible for graphics cards other than the Nvidia GeForce RTX 2080 Ti and RTX 2080 to perform ray tracing, should AMD ever decide to introduce any. Rather than Nvidia's proprietary RTX ray tracing technology, DXR is a universal standard for anyone using Windows 10. Ray tracing is all about more realistic lighting effects, shadow details, and associated elements such as reflections, all of which go towards making a game environment look much more like the real world. Even to the point of imbuing a character’s eyes with the reflection of an explosion, as previously seen in some Battlefield V footage. Naturally the games themselves have to be programmed to benefit from ray tracing, and the catch right now is that there are no titles currently on the market which do so. But they’re coming, and that includes the aforementioned Battlefield V, Metro Exodus, plus Shadow of the Tomb Raider has a patch inbound, and there are a good number of others (when Nvidia first showed off GeForce GPU’s ray tracing capabilities, some 21 titles were highlighted). As we’ve noted previously, Microsoft has already sent the October 2018 Update live so you can grab it now, or wait for the automatic rollout to start on October 9.